On other trips to the US, Emiliano went to Trinidad, CO and Dawson, NM until finally settling with his family in Beaver Falls, PA in 1928. I think in all cases, he worked in the mines. Many of the people listed on this page had connections to or actually lived in Dawson, NM. Look at my Dawson web page for more. In the 1910 census, I found these people in the Village of Mesaba, county of St. Louis, state of Minnesota. These were three families right in a row living on Broadway Street. No street numbers in the record. 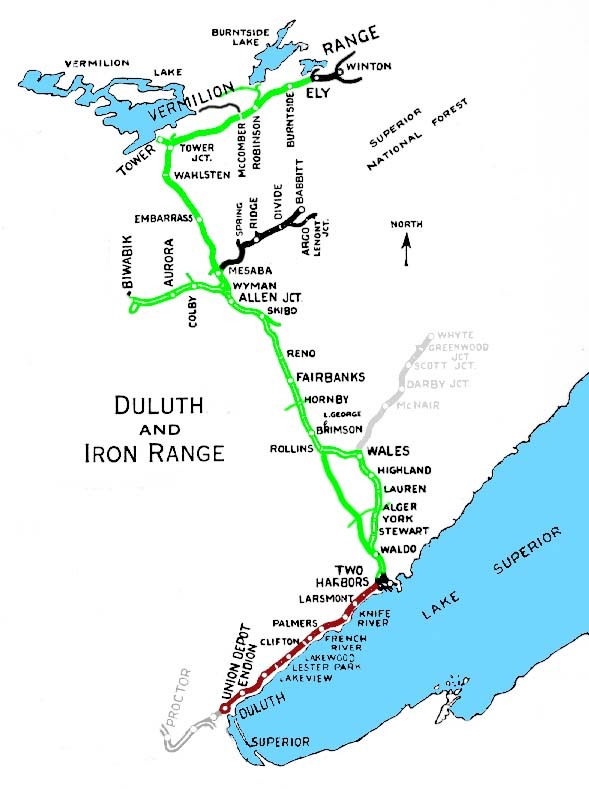 The Village of Aurora and Village of Mesaba are about 5 miles apart, about 50 miles from Duluth which is on the western most tip of Lake Superior. I think in the census they were all lumped into St. Louis County. There is a map below. Cable, son, 11y, born in Colorado <--- is this Cassio? Earl and Alfred must be the same person. From the above pieces of information, we can see that the first Carmine in the 1910 census was Carmine Antonio diLorenzo born 16 Jul 1886. The Silvestro diLorenzo, was is father and his mother was Sabina - the second family in the 1910 census. I still can't be sure this is the Carmine that my grandfather went to live with but odds are that it is especially since we have the connection back to San Pietro Avellana. Maybe Tony (Antonio) Frazzini was also a relative? The 1920 Census (8 Jan 1920) for Routt, CO, shows Carmine, 33y, emmigrated in 1902, in Routt, CO. He worked in the mines. Wife Elisabetta, 27y, emmigrated in 1910, and daughter Antonetta, 9y, born in Minnesota. I have not been able to find him in the 1930 Census. This is the same Carmine by the birth date. DiLorenzo, (Mariani), Antonetta, 97. Survived by her son, Nicola (Mary) Mariani, 3 grandchildren, Antonetta (Kimball) Duncan, Tina (Mark) Krekeler, Rocco (Sandy) Mariani, and four great grandchildren. Mass of the Resurrection at Shrine of St. Anne in Arvada, 7555 Grant Pl., on Thursday, Dec. 20th at 11:00 AM. Burial and reception following." Published in the Denver Newspaper Agency on 12/19/2007. I've found the birth registrations for Silvestro diLorenzo and Sabina Carlino but this still does not show any relationship to my grandfather. Mark's note: This must be the Angela that is the wife of Tony Frazzini. Family was found in the Mesabe, MN 1910 census - see above. See the Antonio Frazzini web page for details of what more I know about Antonio and Angela and their ancestry. Now has Angela's obituary in Denver. Mark's note: I believe that this is the Joe Lorenzo (married to Loretta della Croce) who lived in Dawson, NM. At least Giuseppe's oldest daughter, Florena (? ), was born in Minnesota. Florence diLorenzo married Oreste diCianno in 1926 in Dawson. Mark's note: I also believe that Domenico diLorenzo (or Dominic Lorenzo) is another brother of the family that later on lived in Dawson, NM. Domenico would have been born around 1881 but there are no microfilmed records from that year. At least Domenico's oldest daughter, Sabina, was born in Minnesota. From The Data Banks, these records of Giocondo Silvestro diLorenzo. The ages work out to his birth in 1857. The diLorenzo's and Frazzini's were all going to his brother-in-law, Pasquale Carlini at 473 E 151 St., New York City. Silvestro had been in the US for 12 years. Antonio had previously been in the US, 2 years and Angela (diLorenzo), 3 years. Sabina, Cristina and Carmine had never been to the US before. (You, of course, remember that Angela, Carmine and Cristina were the children of Silvestro diLorenzo and Sabina Carlino, along with Domenico who does not appear here). Antonio Frazzini was Angela diLorenzo's husband. Missing was daughter, Loreta Giulia diLorenzo who was married to Giovanni diCroce (John Crow). I've found this group of people departing Hamburg, Germany. These seem to be new records available on ancestry.com. The ship name does not match the above Ellis Island record. Here is Pasquale Carlini, who had arrived only a few weeks earlier on 17 May 1902 (born about 1873). No destination name or address. Was in the US before but no years given. This Pasquale is not related to me (that I know of). To be Silvestro's brother in law, he must be the brother of Sabina Carlino, wife of Silvester diLorenzo - she did have a brother named Pasquale except that Pasquale was born in 1879. NOTE: I've also found Pasquale and nine of their 10 children in the 1930 Denver census. NOTE: I've also found Pasquale's WWI Draft Registration from Aurora, MN. Wife Cristina. Worked as a steam shovel foreman for the Mohawk Mining Co. Says he was born 29 May 1876 but SPA records show 1 Jun 1877. Of course, the first must be Frazzini and the second might be diLorenzo. Apr 2005: I received the death certificates for these 5 people from the Minnesota Historical Society (my comments in italics). May 2005: I received the death certificate for this person from the Division of Vital Statistics, State of Minnesota (my comments in italics). 1. diLudovico was a common name in MN and SPA. 2A. Mary Anna Frazzini drowned in a creek at the age of one. Reported in 10 Jul 1914 issue of the Duluth News-Tribune "Child Drowned in Creek". Dateline : Aurora, MN. 4. I could not find a Giovanni Frazzini born in 1875 (or any other year) to Domenicantonio Frazzini and Carmina diMartino but there is a gap in the other children where Giovanni could have been born in 1875. Look at my family tree data base for details. 5. 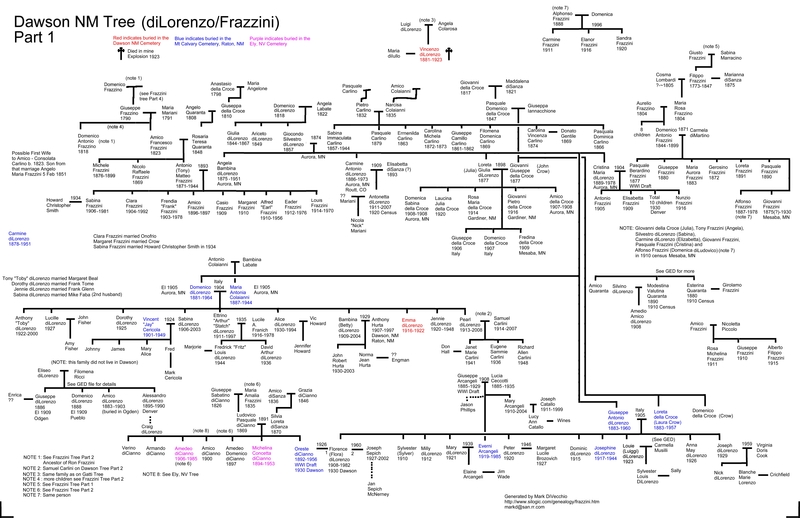 See Dawson Graphical Family Tree (diLorenzo and Frazzini) for more about these families.